If you have a catering business or buffet-style establishment, then having the right set of steam table pans is important for running a smooth operation. Steam table pans, or kitchen pans as they are commonly known, are designed to hold large amounts of food for long periods and are often used to keep warm food warm or cold food cold. Steam table pans are available in a wide variety of sizes to meet your specific food service needs. Kohn-Megibow Company is your resource for new and used steam table pans, and we have put together this guide to help you decide what’s right for you. A full steam table pan is roughly 12×20 inches. These are best for large entrees and bulk service needs like burgers, chicken, hot dogs or even salad greens. As the name would suggest, these pans are 2/3 the size of a full pan (12×13.5 inches), which allows for various buffet arrangements. You will often see these used for mashed potatoes, stuffing or another popular side dish, with the accompanying pan used for gravy. These pans measure out to 12×10 inches and will fit half of the full pan size. These can be used for various side dishes and smaller entrees. At 12×6.7 inches, these pans can be used for smaller items that don’t require as much space. These are great for sauces and gravies. You can put four quarter pans (6×10 inches) together in place of one full pan, or use two of them in conjunction with a half pan. These are common in salad bars to maximize space for the different salad toppings. A 1/6 pan measures around 6×6.7 inches and is usually used for soups, salad dressings, and salad toppings. If you have smaller garnishes, condiments, toppings or ingredients that don’t need to take up much space, you can get a 1/9 pan, which measures out to 4×6.7 inches. Once you figure out what the right pan size is for you, you need to decide what type of pan is needed. These are used for refrigerated items or dry items. You could use them for sandwich or pizza tables. These can be used for both refrigerated and/or heated applications. They can be used in steam tables, hot food buffets, as well as refrigerated and freezing tables. They are amber in color and while being plastic, they are heat resistant. That means they can be used in steamtTables without the danger of melting. These are some considerations you will want to keep in mind when choosing the right steam table pans for your restaurant and food service needs. 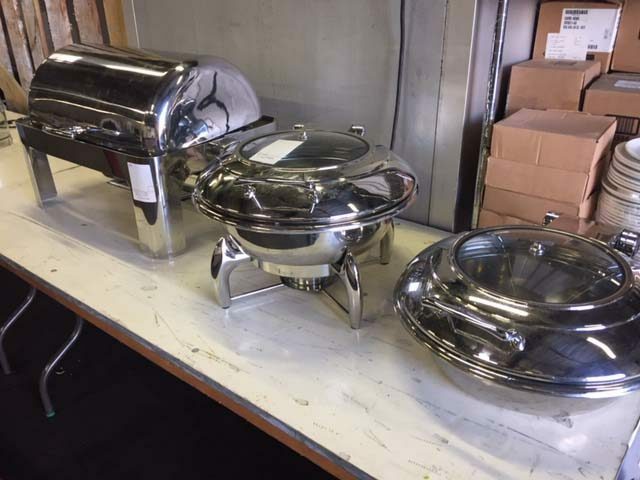 If you are wondering about what equipment is right for you or would like to see what we have available, KMC is your Southern California used restaurant equipment supplier to turn to. Contact Kohn-Megibow Company or stop by today for more information!